I have seen many discussions regarding the L1500 preamp mod (taming via a loading cap or the R7 mod). The R7 mod that I read about is perfect: it matches pretty much the same high frequency content as in passive mode. I was wondering if there is something similar to the R7 mod for the EL Toro? I have a July of 1983 El Toro and the active mode adds a very noticeable treble boost. Many say this bass is a slap machine and was extra bright for that reason. It is a great tone, but I'm no slapper! It seems that perhaps the treble boost is there for cabs that didn't have tweeters/horns as they were still just coming up in popularity at the time? I have solder skills and like to perform reversable mods. I just don't have the electronics know how to look at the schematic and know which part of the circuit is equivalent to R7. Any suggestions will be helpful and appreciated. Also, it appears that my pre is all stock. I will post a pic when I get it opened back up. Being the owner of an El Toro, I too wouldn't mind taming the preamp. If I flip the bass into active, the tone gets really zingy and over-driven sounding. Consequently, I run it in passive and get GREAT sound. OTOH, it would be nice to be able to run active. I just don't want this huge tone difference. You found my thread from last year where I talked about swapping out the preamp for something more modern, but I haven't done anything with that yet. Time.... Plus, anything I do to my Bull would need to be totally reversible because it has a bit of history to go along with the great sound. Tell you what; I'll move this up to Paul's Technicalities. I'll give Paul a heads-up and see how it flies. Very cool, thank you! Was just playing The Bull today after tweaking the set up a touch. Love the tone, but it is zingy! There has to be a simple tweak to the board to simmer it down. Last edited by bigtone23 on Thu May 25, 2017 6:56 am, edited 1 time in total. My 1986 stock El Toro does not add excess treble or zing with the preamp engaged. The preamp ads girth and presence, but not too much higher end. In fact, the preamp is very quiet compared to my 1990/91 L2000. I also drew up a schematic of the circuit board that I was looking at. Here it is. between the the El Toro and these other two basses, the Taming process will be a bit different. connects to ground and the .047uf Treble cap connects to the counter clock wise (CCW) lug. before going to ground, which reduces it's treble boosting ability to almost nothing. sees to ground which reduces the preamps treble boosting ability. What value of resistor you ask? and see how it sounds. The larger the resistor value the lower the treble boosting will be. If you didn't want any treble boosting from the preamp you could just remove the yellow wire all together. 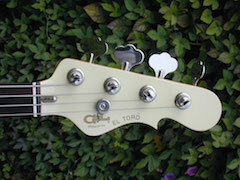 This resistance we are talking about could be compared to the "R7" mods of the L-series basses.......kind of. you can solder a .001uf cap in parallel with it. Anyway, just something to experiment with. I hope this adds a bit of helpful info on the El Toro. Keep us all posted on your mods. I really wish I had one of these basses. Admin note: Click the images for a PDF version. I'll try out your suggestions and let you know how it goes. I experimented with various resistors on the yellow wire. After trying 10K then 220K, 470K, 680K I finally landed on a 1 MEG! It had a pretty equivalent amount of treble when compared to passive. bigtone23 wrote: I experimented with various resistors on the yellow wire. After trying 10K then 220K, 470K, 680K I finally landed on a 1 MEG! It had a pretty equivalent amount of treble when compared to passive. Thanks for taking the time to experiment and sharing your findings. Hopefully this will help other El Toro fans. For sure, thank you for the tips, it made a big difference in what I like about the instrument. I like being in active mode and not have to futz with the treble knob. I have more time right now, so I'll elaborate on what I found. When the yellow wire was disconnected from the treble pot, the tonality of the high end was the same in active and passive mode. No overhyped boost, as expected from your post. I was almost going to leave it disconnected, but still heard a touch more low end in active mode vs passive mode. The 1 MEG resistor gave a touch of treble boost that matches the bass boost in active mode, resulting in a hyped tonality that was balanced. Kind of like the loudness switch on a stereo, but a little more subtle. My El Toro's layout is exactly like the drawing above. Since I already had the .0022uF loading cap on my bass pot and the bass sounded fine, I didn't experiment with it. Next time I have it open, I will try putting a small cap in parallel with it just to hear the difference. I think it's safe to say that putting that resistor on the CW lug of the treble pot is the key to taming The Bull!